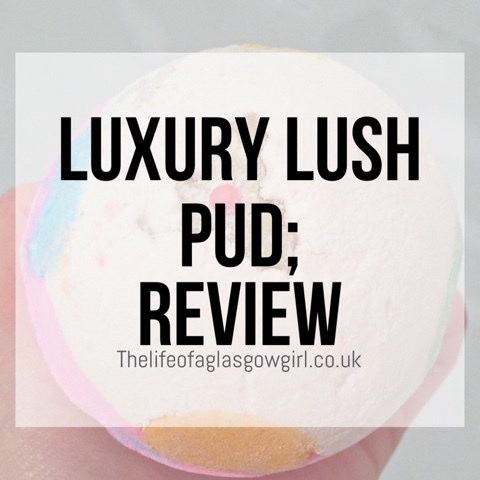 Luxury Lush Pud really does look beautiful and in my opinion it really does draw you in with its looks and hooks you with its scent. This bath bomb is very aesthetically pleasing, the bright pink paired with the simple and elegant white makes it pop, then lush have achieved the pudding look with the polka dots of colours through out and the signature pudding holly and berry on top in the form of candy holly. I really think this bath bomb should get top marks all round for its overall design as I feel like it is very inviting and very festive, I know that for me it was the look that drew me in and got me intrigued. 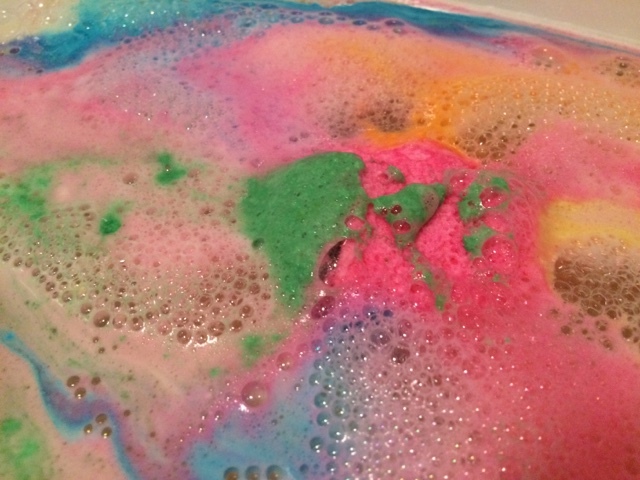 For me the scent if this bath bomb resembles that of the Twilight Bath Bomb. 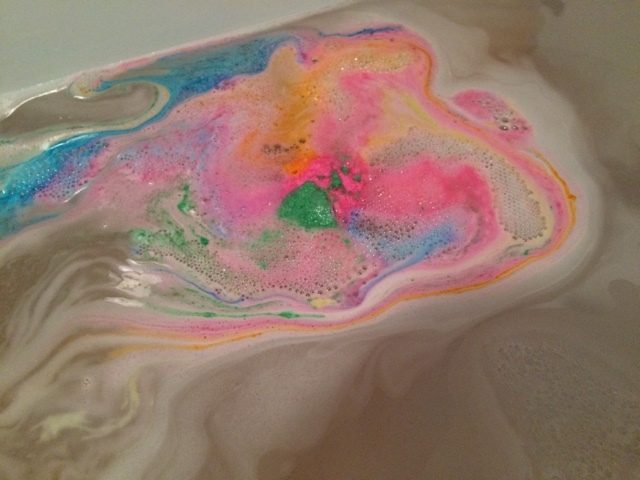 The Luxury Lush Pud really pleases my sense of smell because not only does it resemble one of my favourite bath bombs it adds something a little bit more, its strong and commanding which is a trait I love in bath bomb, I like them to be strong and stick around for ages after my bathing experience and that is definitely something this bath bomb does. For me describing scents is pretty hard because really, how do you describe a scent? But to me I find this one very "Girly" for want of a better word, it's also sort of musky but not in an overbearing way. 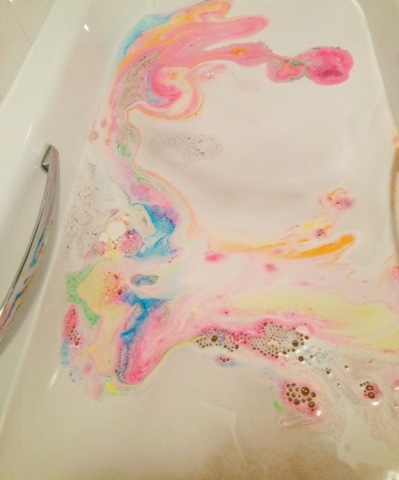 This bath bomb is a beauty when it hits the water, an array of colours ooze from the bath bomb as it fizzes around the water, leaving a trail of bright colours that send you to your happy place. 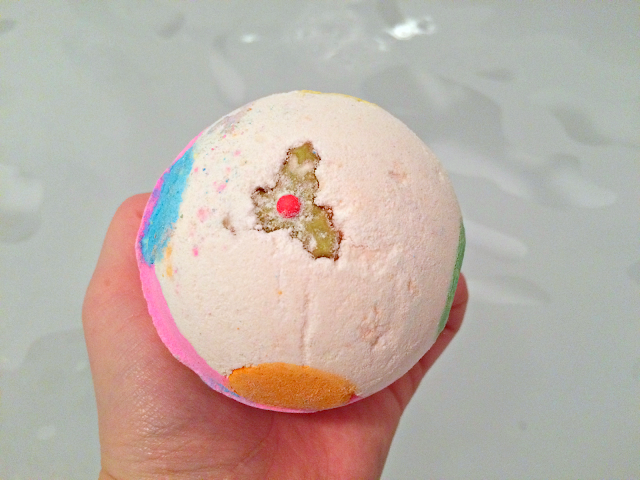 I love watching bath bombs as they go and this one really hits the spot. As pink is one of my faviourite colours, this bath bomb provides everything I need for a great bathing experience. It creates beautiful bath art that leaves you feeling relaxed and satisfied. 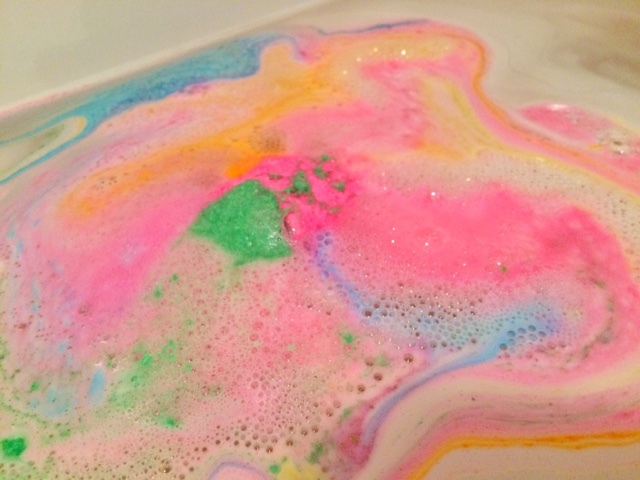 All in all I really love this bath bomb! The colour display that it puts on as it fizzes around the water is spectacular and the scent sticks around for a good while afterwards. The water is left feeling smooth and I didn't notice a difference in my skin, it wasn't dry once I left the water as I have read happening to others so I guess it is true, products work differently for everyone. I just really like this product and how it works. Top tip: STOCK UP! because it's a seasonal product it won't be around for long and it does tend to sell out fairy quickly. So what do Lush say? "Catch 40 winks on Christmas Eve with islands of sleepy foam and comforting lavender. Tonka absolute provides the perfect Christmas dessert for your skin, while the reassuring scent of lavender oil and creamy benzoin resinoid banishes tension and aids relaxation. Soothing for excited children and grown ups alike." Gosh these bath bombs almost look edible! I really need to try these out for myself as I've read so many good things about them. I need this in my bath. I like the sound of it. Great colours! Sounds like a treat. If only I had more time to have a relaxing bath. OMG! I love bath bombs just to relax in the bath tub reading books while candles lit up. I've always wanted to try Luxury Lush pud but always sold out in my area. This looks awesome! Will have to try some of these out.